Inspired by the Kiva.org model, but focused on providing basic services instead. McKinsey Social Innovation initiative: vote for your favorite video! To support the research component of the project 20 PhD positions for junior researchers are funded by the project. The positions are based at the premises of the 8 project partners. The PhD fellow will report to the professor in charge at the host academic institution. The PhD fellow will have high degree of involvement in execution of the research package assigned to the host institution under this project. The PhD fellow will be awarded the doctoral degree by the host institution. The list of 5 research themes and number of PhD positions per partner and research theme is shown in table (see website). Palo Alto, CA (CNN) -- It does not make for pleasant dinner conversation. But we have a global sanitation crisis. More than 40% of the world's population does not have access to a toilet. These 2.6 billion people, most living in low- and middle-income countries in Asia and Africa, face the daily challenge of finding a bush, train track or empty lot where they can urinate and defecate in relative privacy. Between 1990 and 2008, the share of the world's population that had access to basic sanitation increased only 7%, to 61% of the world's citizens. In many developing countries, mobile phone penetration is expanding at a faster rate than sanitation. In Tanzania, for example, half the country's citizens have mobile phones, but only 24% use an improved sanitation facility. Saturday marks the 10th anniversary of World Toilet Day, a day set aside not simply as a celebration of this most venerable and useful of technologies, but as a way to draw attention to the crisis and some possible solutions. This sanitation crisis is not only an affront to dignity. It results in the release of hundreds of tons of feces and urine each day directly into rivers, lakes, landfills and oceans, creating an immense human and environmental health hazard. Every day more than 4,000 young children die from sanitation-related illness. Fully half of the hospital beds in the developing world are occupied by people whose ailments can be traced to poor sanitation. The authors introduce two alternative measures for assessing household demand for basic services in developing countries, where access to cash is limited: Willingness to borrow, and willingness to work. A very interesting business model-- I wonder how much biomass must be delivered to each local hub to keep the cycle going. National Geographic Daily News: Human Waste to Revive Haitian Farmland? 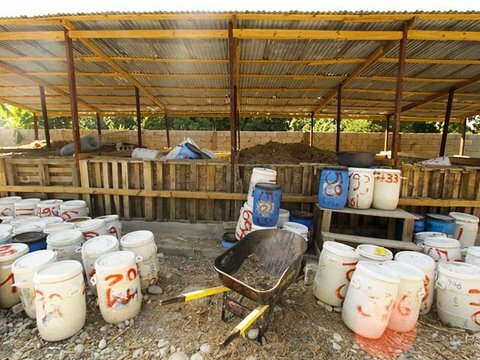 A new type of public toilet is helping people in Haiti make fertilizer from human waste, a project that may someday revive the country's degraded farmland, curb disease, and create jobs. Since 2006 the U.S. nonprofit Sustainable Organic Integrated Livelihoods (SOIL) has been installing public toilets in Haiti, where 80 percent of the population has no access to sanitation. Most Haitians are forced to dispose of their waste in waterways, plastic bags, or even abandoned buildings, according to SOIL. Any existing toilets are often poorly designed, with waste flushing straight into rivers or groundwater. Such practices mean that human feces easily get into the water supply, which can cause waterborne diseases such as cholera, currently at epidemic levels in the country, according to the U.S. Centers for Disease Control and Prevention. More than 6,000 people have died and 420,000 have been sickened since cholera broke out in Haiti in October 2010. "Sanitation was the most successful health intervention in the modern world," said SOIL co-founder and soil ecologist Sasha Kramer. But in Haiti, "poop getting into water is the leading cause of death." BEIJING—As Li Wenpeng traveled in rural China over the past decade to assess groundwater quality, he encountered a grim reality. In many villages he visited, locals were drawing water from contaminated wells and rivers. “It's often the only water source available,” says Li, chief engineer with the China Institute of Geo-Environmental Monitoring in Beijing. “You have places where the entire village is sick” with diarrhea or cancers of the digestive tract, he says. The Chinese government is about to throw these villages a lifeline. On 28 October, the State Council unveiled a $5.5 billion initiative over 10 years to prevent and treat groundwater contamination. The plan will bolster monitoring and push development of groundwater cleanup technologies. The project is long overdue, hydrologists say. Water is scarce in China, which ekes by with only one-quarter of the global average for water per capita. Roughly 70% of Chinese get their drinking water from underground—and the economic boom of the past few decades has tainted much of that supply, says Lin Xueyu, a hydrologist at Jilin University in Changchun. Disasters like the petrochemical plant explosions in 2005 that spilled 100 tons of benzene and other chemicals into the Songhua River near the Russian border have exacerbated China's woes. “The situation is dire,” Lin says. Fully 90% of China's shallow groundwater is polluted, according to the Ministry of Land and Resources, and an alarming 37% is so foul that it cannot be treated for use as drinking water. Common pollutants include heavy metals, organic solvents, petrochemicals, pesticides, and nitrates. The toll is significant: Every year, an estimated 190 million Chinese fall ill and 60,000 die because of water pollution. According to the World Bank, such illnesses cost the government $23 billion a year, or 1% of China's gross domestic product. And that doesn't factor in the impact on China's ecosystems and food supply. Matt Damon, listen up: After five years of covering Africa, our departing correspondent tells how his perceptions have changed about a complex continent, including why some Africans resent celebrity visits.